The piano music of Gabriel Fauré is among his best known work. Written between the 1860s and the 1920s, Fauré's major sets of piano works are thirteen nocturnes, thirteen barcarolles, six impromptus and four valses-caprices. These sets display the change in his style, over the decades, from uncomplicated youthful charm to a final enigmatic but sometimes fiery introspection, by way of a turbulent period in his middle years. His other notable piano pieces, including shorter works, or collections composed or published as a set, are Romances sans paroles, Ballade in F♯ major, Mazurka in B♭ major, Thème et variations in C♯ major, and Huit pièces brèves. For piano duet, Fauré composed the Dolly Suite and, together with his friend and former pupil André Messager, an exuberant parody of Wagner in the short suite Souvenirs de Bayreuth. Much of the ambidextrous Fauré's piano music is difficult to play, but it is rarely virtuoso in style. The composer disliked showy display, and the predominant characteristic of his piano music is a classical restraint and understatement. Megaliths, some decorated, were a part of the culture of the island of Nias off the western coast of Sumatra, Indonesia. Among the many uses of these large stones were statues, seats for the chieftains, and tables where justice was done. Additionally, some stones commemorated the deaths of important people. 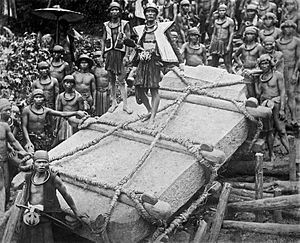 In this 1915 photo, such a stone is hauled upwards, reportedly taking 525 people three days to erect in the village of Bawemataloeo. ... that Hebrew publisher Hayyim Selig Slonimski (pictured) was awarded the Demidov prize of 2,500 rubles in 1844 by the Russian Academy of Sciences for the invention of a calculating machine? ... that the Pasco-Kennewick Bridge in Washington was the first of its size to be financed entirely by sales of stock? ... that the 1974 film Lost in the Stars, set in apartheid-era South Africa, was actually shot in Oregon? Antonio Soler was a Spanish composer, primarily for organ. This is his 84th sonata, performed by Wikipedian Ashtar Moïra.